Pack up your troubles in your old kit bag and smile, smile, smile. So sang British soldiers marching to war in both World Wars. A Lucifer was a type of match, now no longer available, remembered only in the song and probably by matchbox collectors. Given that they contained poisonous phosphorus, preserved with sugar and that several children died each year from sucking them, it is just as well. Matches are basically chemically treated sticks that burst into flames when struck. Today, around 500 billion matches are used every year, with around 200 billion from matchbooks. So, how did it all begin? We don't exactly know when humans first started making fire by rubbing sticks together, followed by fire making by using flint and steel. The Greeks told that Prometheus brought fire from the Gods. We do know rather more about the history of matches, though. Sticks with sulphur at one or both ends were originally used to get fires going which had already started and the largest were used to light chandeliers. Sometimes, lengths of thick cotton or flax dipped in sulphur were also used. In 1680, an Irishman named Robert Boyle discovered that if you rubbed phosphorus and sulphur together, they would instantly burst into flames. He has discovered the principle that was the precursor of the modern match. Following this discovery, various other methods were tried, some using involved gaseous hydrogen, but all were cumbersome and dangerous. The next discovery was by an Englishman. In 1827 a pharmacist called John Walker produced 'sulphuretted peroxide strikeables', which were a yard long4, and then developments followed reasonably quickly. Samuel Jones of the Strand copied John Walkers invention, and it was Jones who first sold it as a Lucifer, c 1829. There was a rather dangerous match invented in 1828 called a Promethean. It had a small glass bulb with sulphuric acid, and the bulb was coated with potassium chlorate, sugar and gum, wrapped in a paper spill. You break the glass bulb with your teeth to 'strike' this match. Charles Darwin used it and was much taken by it. In 1832, small phosphorus matches were manufactured in Germany; they were extremely hazardous. They could ignite with a series of explosions that scattered dangerous bits of fire over the carpet. They would also explode when trodden upon, which increased the danger of having them around. In 1836, Alonzo D Phillips registered a patent in the United States for the manufacturing of friction matches called 'Loco focos'. A Loco-foco (supposed to mean 'self-lighting') was originally a self-igniting cigar patented in New York in 1834 (and probably the original exploding cigar). It then became applied to the Lucifer match. It was later applied to a political party, the Democrats, after an incident at a party meeting in 1835 at which opponents of the radical element within the party turned out the gas lights, but the radicals promptly produced candles which they lit with loco-focos. In 1855, a Swede, Johan Edvard Lundström produced the first red phosphorus 'safety' matches, following the discovery of amorphous (red) phosphorus in 1845 by Anton von Schroetter. The safety match had been invented by fellow Swede Gustaf Erik Pasch, a professor in chemistry. The safety aspect was that the match did not contain all the elements for combustion. This was achieved by a chemical reaction between the match head and the striking surface6. Red phosphorus was first manufactured in quantity by the firm Albright in Birmingham, England from 1851. Joshua Pusey, an American in 1889, after he wondered why they had to be so bulky, invented book matches. Interestingly they didn't take off until the Mendelssohn Opera Company used them to advertise their opening night, and suddenly, everyone wanted them. Matchbooks are still used to advertise such things as restaurants and they are available from some outlets with your personal details on them. 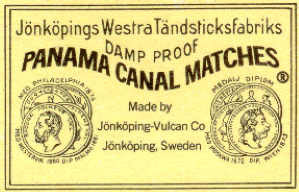 So, now you know the rest of the story of those world famous matches made exclusively for the Panama Canal Company. After the treaties these matches began to disappear and the following matches were seen in the old Canal Zone. For me it just didnt seem the same. Today in some circles these matches are called redheads and the old Panama Canal Company Matches are now collector's item.